I've been doing some meal prep recently and one of the things I do is make some spreads to use on sandwiches and as dips for veggies. I'm not very good at making time for meal prepping, so my prep is usually just an odd hour or two somewhere during the week where I make one or two recipes like spreads, soups or a batch of seitan that don't take a lot of time, but result in a handy stash of food that can be made into fast meals later. 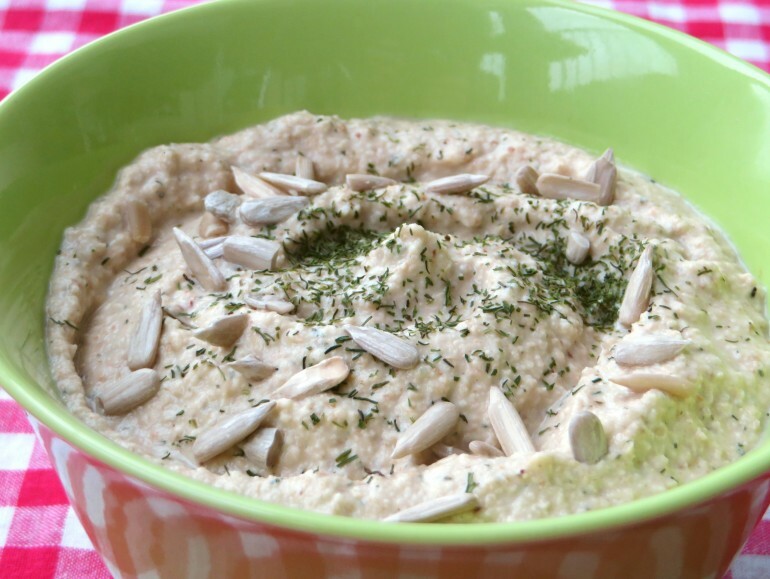 This sunflower seed spread is super fast to make and has lots of flavor. The secret is to roast the sunflower seeds before blending, to give them a nice savory punch. The whole batch has about 18 grams of net carbs, but you only use a little bit at a time, so it has maybe 2 or 3 grams of carbs per serving. You can use this spread on crackers and low carb bread, in (lettuce) wraps, as a dip for veggies or as a sauce for bowls. Put a small skillet on medium heat and roast the sunflower seeds for a few minutes until they start to get a little darker in color. Don't let them get too brown. Add all the ingredients to the jar of your food processor or high speed blender and and puree into a nice spread. If the spread is too thick for your machine, add a little extra water or oil. Don't worry about getting it perfectly smooth, I actually like it better if it still has a bit of texture. Taste to see if you like the flavor and add a little more lemon juice, sweetener salt or herbs if you want. You can use the spread right away, but it's best to refrigerate it for a few hours first so the flavors can develop. In the fridge it will stay fresh for about a week. Thank you for you comment Hannah! Have fun exploring the recipes.